You'll receive this quest from Aufra in her house in Gilded Vale. Aufra will tell you that she's pregnant, and that she's worried her child will be hollowborn. She'll then ask you to travel to Anslog's Compass to the south, where Ranga the local midwife moved two seasons ago. Supposedly Ranga knows how to mix a potion that can prevent children from becoming hollowborn, and Aufra will give you 20 cp so you can buy it from her. Agreeing to run this errand will earn you a "slight" reputation bonus with Gilded Vale. 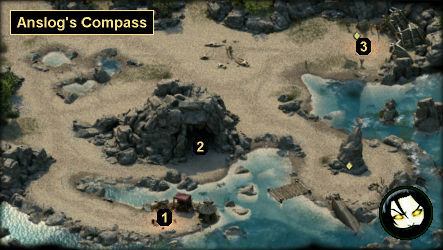 You'll find Ranga and her assistant Tana in the southern part of Anslog's Compass (#1). Of course, Ranga won't want to sell you the potion; she'll ask you for a favor instead. She'll tell you that a local Xaurip Priest wants Tana dead, and she'll ask you to eliminate the problem for her. The Xaurip Priest can be found in the northeastern part of the map (#3). He'll have a few regular Xaurips with him, but the battle shouldn't be too tough. When you return to Ranga, she'll reward you with a Potion of Minor Endurance, a Potion of Minor Recovery, and a Potion of Minor Regeneration, but she won't give you Aufra's potion yet. She'll tell you that to concoct it, she'll need Dank Spores from the Sporelings in the cave to the north (#2). Inside the cave you'll encounter three Sporelings and a Dank Spore. The Sporelings can run around, but the Dank Spore can't move, so you should immediately retreat when the battle starts. That way you'll be able to fight the Sporelings in one fight and the Dank Spore in another. Each Sporeling will drop at least one set of Dank Spores. When you return to Ranga (#1) this time, she'll give you a Stoppered Vial. However, she'll reveal that while it isn't really a cure, it's the best she can do. "I can tend to ailments of the body. I cannot cure an affliction of the soul. Certainly not one inflicted by the gods." That means when you return to Aufra with the potion, you'll have to make a decision about how to complete the quest. If you tell Aufra the truth, then she'll be devastated, but she'll reward you with 10 cp and a Minor Cloak of Protection. You'll also receive a "moderate" reputation bonus with Gilded Vale. If you lie to Aufra, then she'll suddenly become more optimistic about her baby, and she'll reward you with 10 cp. You'll also receive a "major" reputation bonus with Gilded Vale.